I’m a fair-weather gardener. I basically ignore my back yard all through the wet, dark winter. I’m always a bit nervous when I venture out for the first time in spring, blinking like a mole and stunned by all the work there is to do. 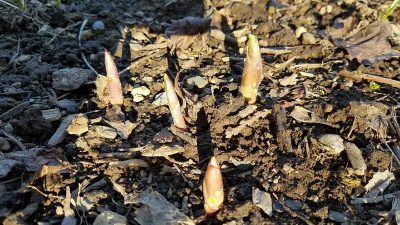 What survived the winter? 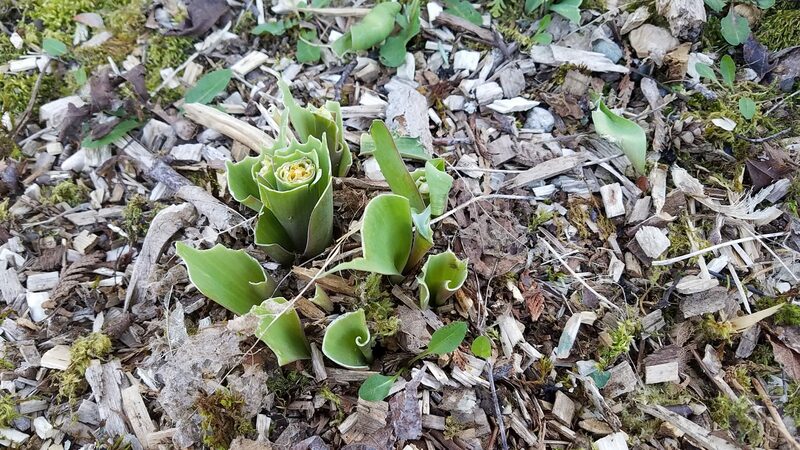 What is showing new growth, and what was smothered under the carpet of leaves I never managed to rake up? 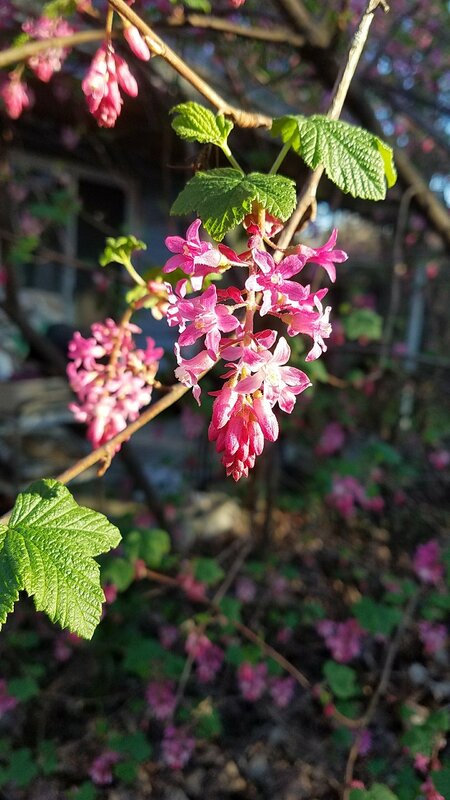 For the last week I’ve been seeing hummingbirds on the flowering red currant outside the dining room. Last night I finally went out and joined them. 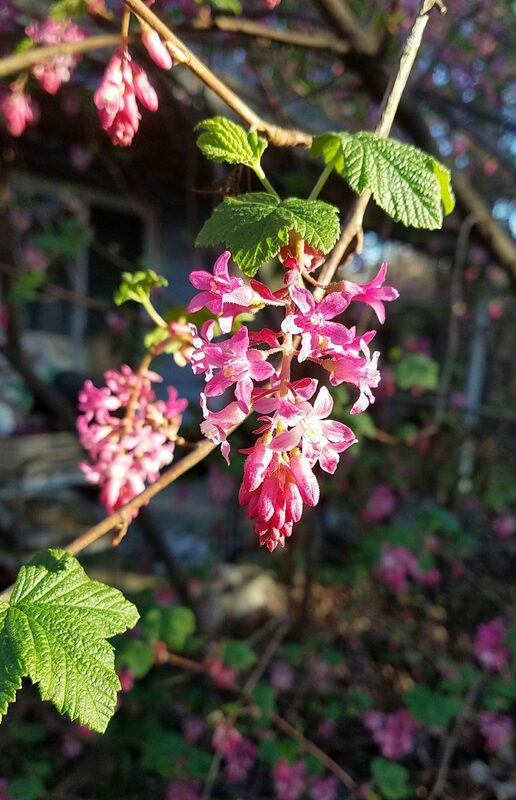 Flowering Red Currant, Ribes Sanguineum, is a Pacific Northwest native that’s done well in the nursery trade. It flowers early and beautifully, and hummingbirds love it. I have a large one right outside the back door, where I can enjoy the blooms — and the hummingbirds! — even when I’m refusing to go outdoors. I planted a second one near a fence last spring. 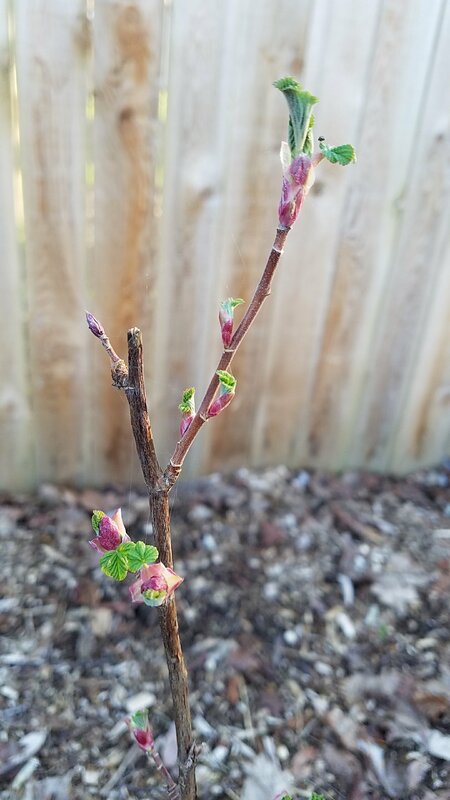 It was little more than a stick when I planted it, and from the house you can’t tell it’s alive. On closer inspection, it’s just a little slower to leaf out than it’s big relative. 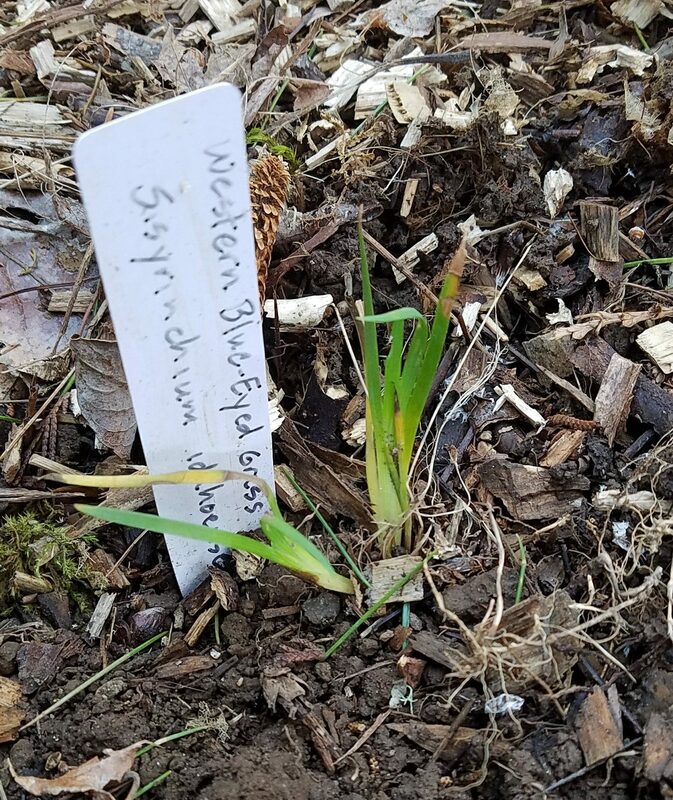 Near the Flowering Red Currant twig, almost overwhelmed by mulch, I discovered that the Idaho Blue-Eyed Grass (Sisyrinchium idahoense) was still alive. I’ve planted it once before only to have it die. It’s no bigger than it was when I planted it, but at least it’s still there. Hopefully it’ll like this spot better than the last one. 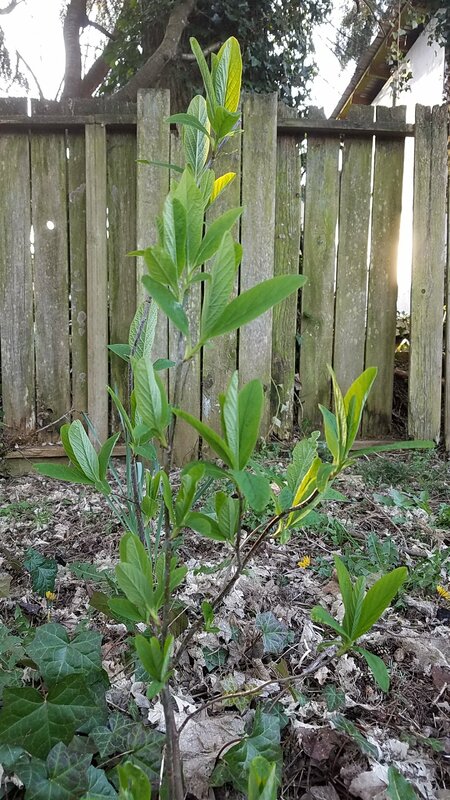 Another exhibit in my “I promise, it’s not just a stick!” collection is this Sitka Willow (Salix sitchensis). Only… it is just a stick, because willows are a little bit magic. If you cut a branch off a willow and stick it in the ground, especially in early spring, it will root. In fact, when my large Sitka Willow lost a big limb in an ice storm a few years back, the chopped-up pieces of the limb rooted themselves to the ground, straight through the bark. Willow’s rooting power is so strong it’s used to make rooting hormone for starting other plants, and it makes willow incredibly useful in habitat restoration work. 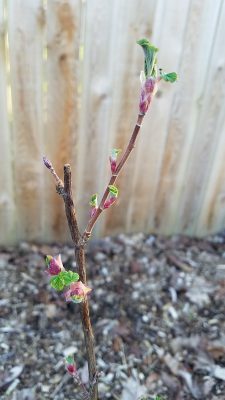 You can pound willow stakes into the ground with a hammer, and most of them will grow. 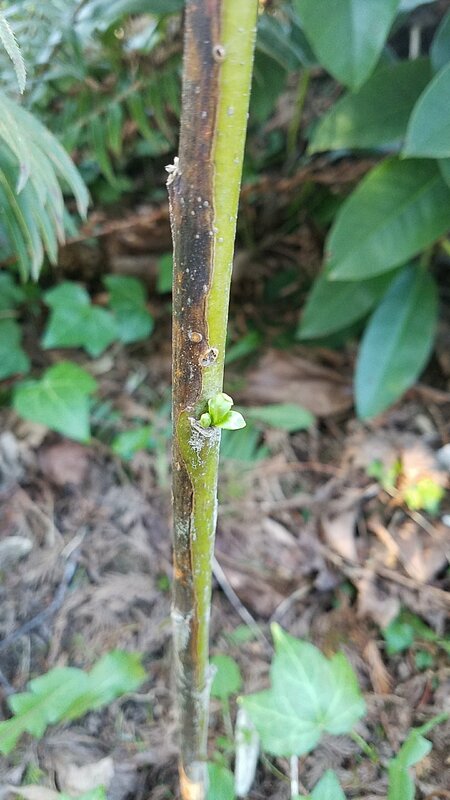 This willow-stick is intended to be a replacement for my big willow tree, which started off scraggly and off-balance and only got worse as it’s lost limbs in various storms. If the scion keeps doing well, I’ll have the big one taken down. I hate to take down trees, but it will give the backyard more light (and keep the tree from crushing the fence). Willow is a great habitat tree, so I definitely want this replacement to thrive. In the back corner, three osoberry (Oemleria cerasiformis) are persevering despite ivy. I only took a picture of the prettiest one. The other two are making a valiant effort, but look pretty ragged. The little spires poking out of the ground belong to false solomon’s seal (Maianthemum racemosum). Last year it only had two stems, so this is a great sign it’s becoming established. All in all, the plants I was most worried about — all Pacific Northwest natives — are doing quite well! I hope the deer enjoyed them. Tulips! Yes! Nom nom nom nom nom nom nom nom nom nom nom!